In what it describes as “an important development for the ferroalloy industry,” Tenova Pyromet has introduced a new, patented technology for the high-temperature cleaning of furnace offgas generated in a closed ferroalloy smelting process, enabling smelter operators to use the cleaned gas more easily in a number of co-generation plant options. 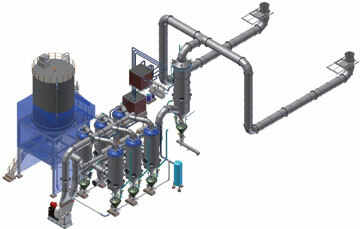 Tenova Pyromet said its new technology for cleaning of furnace off-gas—shown here in model format—will be highly useful in applications where there are medium off-gas volumes at high gas temperatures, off-gas containing unwanted components such as tars, and where specific clean gas properties are required. According to Tenova Pyromet, which is part of Tenova Mining & Minerals, the new method and process to cool and clean the mainly carbon monoxide rich furnace off-gas was developed through a combination and modification of current technologies, successfully addressing the shortcomings of the traditional industry method of wet scrubbing systems. These include reducing the solid content in the cleaned process off-gas to below 5 mg/Nm3, reducing moisture in the cleaned process gas by reducing or eliminating the use of water, eliminating condensation of tars on colder surfaces for certain process off-gases by operating above the tar dew point of the process gas, and eliminating the wet scrubber liquor water treatment system, which can be problematic when a process off-gas with tars present is to be treated. The basic principle of the new technology is to clean the process gas as hot as possible using filtration separation technology. Solids are separated and collected from the process gas by passing it through high temperature filtration elements, which are periodically cleaned using an inert gas. The resultant solid gas content of the cleaned gas is below 5 mg/Nm3, as opposed to the 10 to 50 mg/Nm3 of wet scrubbing systems, and is suitable for direct use in any power generation or heating system. If high-volatile reductants are used, the hot gas with tar in vapor form passes through the filtering section for cleaning before entering a suitable tar removal system, prior to being used in a power generation system or heating system. The collected tars from the tar removal systems can be used as a fuel or safely disposed of. The process, said the company, can thus be applied beneficially as an alternative to conventional wet gas cleaning systems in a number of applications. 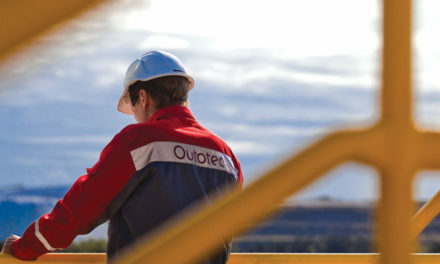 These include applications where there are medium off-gas volumes at high-gas temperatures, off-gas containing unwanted components such as tars, and where specific clean gas properties are required, such as low moisture content, low solid content and a gas temperature above the dew point for further processing/cleaning. “This new technology is an important development for ferroalloy producers, as the industry is facing increasing challenges in terms of harder to access and lower grade carbon reductants, compounded by escalating power costs, as well as increasing legislative and social pressure to minimize impact on the environment,” said Chris Oertel, managing director of Tenova Pyromet. “The increasing cost and diminishing supply of metallurgical grade coke as the main source of carbon for reduction reactions in closed ferroalloy smelting have led producers to use alternative sources of carbon, such as coal with high-volatile matter. When a high percentage of this lower-grade coal is used, tar vapors can be present in the furnace off-gas, which, in wet gas cleaning, will condense when the gas is in contact with colder surfaces or water, creating operating, maintenance and water treatment problems. “In addition, the rise in electricity prices has made it necessary to consider utilizing all the gases as a source of fuel for producing electrical energy in a co-generation installation,” he said. Tenova Pyromet specializes in the design and supply of AC and DC furnaces for the production of ferroalloys, platinum group metals, base metals, slag cleaning and alloy refining, and also designs and supplies plant equipment that is associated with furnaces such as material handling and pre-treatment, alloy conversion and refining, granulation of metal, matte and slag, furnace off-gas fume collection and treatment, and treatment of hazardous dusts and waste. Earlier this year, Tenova Pyromet reported it had successfully completed cold commissioning of two 33-MVA ferromanganese/silicomanganese furnaces for SARDA Metals and Alloys (SMAL) in India. Awarded in 2010, the contract from SMAL covered supply of the full electrode columns and automatic furnace controller (AutoFurn), as well as the full basic plant design. This greenfield development near Vishakhapatnam included an 80-MW captive power plant, and the generated capacity will be distributed between the two furnaces and the local power grid. Included in plans for the plant are an extensive greenery project and a rainwater harvesting dam, which will reduce the plant’s overall carbon footprint, making it one of the most environmentally friendly plants in India. In carrying out the project, Tenova Pyromet said it drew on its operational plant experience as well as on state-of-the-art software tools to fully assess the characteristics of the client’s raw material in the development of the critical furnace dimensions. Mass and energy balance models enabled the cmpany to study the effects that input changes, such as different raw materials, would have on the process. The process design was complicated by the need to blend the lower manganese-content Indian ores with other higher grade manganese ore from South Africa or Australia, in a two-step process route required to produce 78% high-carbon ferromanganese and silicomanganese with 65% manganese. Tenova Pyromet has completed cold commissioning of two 33-MVA ferromanganese/silicomanganese furnaces for a plant, shown here, operated by SARDA Metals and Alloys (SMAL). The company said its understanding of the different mineralogies of the South African, Australian and Indian ores, enabled an optimized process to be designed, in conjunction with the use of Tenova Pyromet’s submerged arc furnaces and furnace controllers. Optimization included not only the process but, as the mass and energy balance models are directly linked to financial models, also the project NPVs, IRRs, break-even and cash flows, in conjunction with changes in input costs, assumptions, input raw materials and process parameters. These models were used “live” to be able to find the best solution for the client’s specific situation. Tenova Pyromet said the electrode columns designed and supplied to SMAL offer exceptional operational availability and power efficiency, with features including a robust lower electrode system with protection for key equipment, and a modular arrangement for easy maintenance. The slipping device, a market leader in electrode control, has a clamping shoe configuration that is able to exert adequate pressures on the electrode casings, reducing the risk of casing buckling/damage. Tenova Pyromet’s AutoFurn is used to automate the furnace, controlling electrode movement and the transformer. By prioritizing the alarming convention, it is possible to operate these large plants with a lean workforce. The raw material handling systems to feed the furnaces make use of a rotary conveyor—a recent Tenova Pyromet development—which feeds the furnace charging feedbins. By being able to rotate both clockwise and counter clockwise, the rotary conveyor reduces lag time between charging of each bin. Tenova Pyromet said it has worked with both the private and state sector ferroalloy industry in India since 2004, when it was contracted by Nava Bharat Ferro Alloys Ltd. to design and supply the electrode column and electrode seals for its 24 MVA silicomanganese furnace. Besides significant repeat work from Nava Bharat, it has also since worked for a number of other leading companies, including Steel Authority of India Ltd. (SAIL), Indian Metal & Ferro Alloys, Visa Steel and Visa Bao. As raw materials and other resources become scarcer and plants look for new ways to be more efficient with energy use and operations, mineral processing equipment supplier Metso reported that is developing its portfolio of intelligent processes and service solutions to help customers meet these challenges. According to the company, today’s top drivers in minerals processing and aggregate production are safety, productivity and cost efficiency. Automation and intelligent solutions enable plants to improve both their financial and environmental performance. Metso provides these industries with a combination of in-house expertise on processes, plant-wide automation and energy-efficient equipment and processes. Metso’s flagship system for minerals processing and aggregate production is Metso DNA. It is a scalable system that can be expanded step by step from one subprocess to another to build a complete plant-wide system including advanced process controls, analyzers and information management. It can also be easily integrated with other suppliers’ systems. The system is complemented by a wide technology and service offering. “In hard economic times when plants have no extra money for new machine investments, they can get more out of their existing equipment and processes through automation and intelligent solutions. Productivity and cost efficiency can be improved by optimizing process performance and minimizing lost time,” said Kari Heikkilä, director–minerals processing systems automation for Metso. According to Heikkilä, Metso is currently developing solutions that will embed automation even further within the machines, enabling them to intelligently communicate with each other. Active R&D within Metso and collaboration with recognized research institutes keeps the company at the forefront of technology. By enabling better process control and visibility, an advanced automation system keeps processes running smoothly. Accurate online measurement information and diagnostics show how the machines and the plant are working; a single piece of data can make or break the process. For example, condition monitoring solutions installed on large machines enable preventive maintenance and help avoid costly unplanned downtime, resulting in better machine reliability and availability, Metso said. “You have to measure a process in order to control it. Plant stability is the key to good overall capacity, high-quality end products and safe operation,” Heikkilä said. Declining ore grades and complex ores with more impurities mean getting more out of less and cause headaches in minerals processing. Minerals recovery can be optimized and production boosted through seamless integration between Metso’s systems, online data, equipment, services and innovations. It also enables the reduction of energy and water consumption, resulting not only in cost efficiency but also in a lower environmental impact. Safety is a high priority, and having zero accidents is every plant’s goal. Automation removes operators from the vicinity of the machines to the safe control room environment. The level of safety is increased through better information distribution. Recently, Metso DNA systems have been ordered from SSGPO in Kazakhstan, Codelco El Teniente in Chile and Norilsk Nickel Kolskaya GMK in Russia. “Over the years, we have delivered systems to mining customers, for example, in Scandinavia, Europe, Russia, Brazil and Chile,” Heikkilä said. 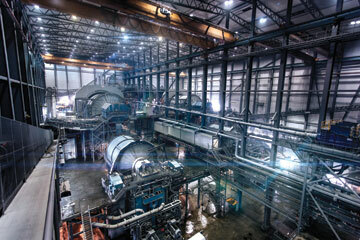 Metso is responsible for grinding mill maintenance at Boliden’s Aitik copper mine. The copper producer recently set a company record for plant throughput at Aitik, where mill availability has been holding steady at 97%. One of Metso’s longest-standing mining customers is Yara Siilinjärvi, located near Kuopio, Finland. It is the only phosphate mine in Western Europe and has boosted its productivity with the Metso DNA automation system since 1979. According to Metso, cooperation between the two companies for more than 30 years has ensured reliable, high-quality production at the plant. With accurate measurements and analyses, the plant has been able to optimize both the process and use of raw materials, thus preventing any overuse of expensive materials. Being able to control the entire production chain has increased control accuracy and improved both the quantity and quality of the plant. Metso said the role of plant-related service and performance agreements is constantly growing. It recently announced that its long-time customer, Swedish mining company Boliden, had set a new production record at its Aitik copper mine. On July 14, 144,912 tons of ore passed through the plant, and thanks to a steadily increasing average production, July ended up being Aitik’s most productive month to date with 3.5 million tons of ore. The mine is now operating at an annual rate of 45 million tons. Boliden’s official target for 2013 is to produce 38 million tons of ore in Aitik. The new record, according to Metso, marks a significant milestone in the collaboration with and Boliden. Metso is responsible for all maintenance in the grinding mill circuit in the Aitik concentrator, and has supplied most of the equipment, including two 11.6 by 13.7-m AG grinding mills. In September 2012, the two companies signed a three-year extension of a comprehensive Life Cycle Services contract. The contract is cost-per-ton based, meaning that Metso gets paid based on Aitik’s production. The higher the output, the more both parties benefit. The two companies have been working together since the 1930s under various services agreements. This one-of-a-kind history, said Metso, has provided expertise in maximizing mill uptime, a key factor in breaking production records at Aitik. “Thanks to our experience, we know when to run the mills a little bit longer and just how to get a bit more out of the mill linings. At the moment, we are at 97% mill availability, meaning that only 3% of hours are spent on maintenance annually. Everything else is production,” said Christer Brännström, general manager, SBL Operations, Sweden, Metso Mining and Construction.